Blowout Sale! Save 51% on the Ceiling Fan Pull Chain Set - Includes 1 Light and 1 Fan Chain Pulls - 12 Inch Ceiling Fan Chain Extender with Ball Chain Connector - Oil Brushed Bronze Finish by 1CAMO at Result BD. MPN: 12in-ORB-LIGHTFANCHAIN. Hurry! Limited time offer. Offer valid only while supplies last. Actually be able to reach AND identify your ceiling fan pull chains with these gorgeous, oil rubbed bronze fan and light ceiling fan chain extenders! Actually be able to reach AND identify your ceiling fan pull chains with these gorgeous, oil rubbed bronze fan and light ceiling fan chain extenders! The fan embossed image is three WIND waves. The light embossed image is a SUN. This ceiling fan pull chain set fits ANY ceiling fan PERFECTLY! Large ceiling fans, contemporary ceiling fans, outdoor ceiling fans and more! Quickly slide the ball chain into the medallion eyelet, slide the chain up into place, then snap this ball chain connector onto your existing ceiling fan chain and you will be able to EASILY pull the correct chain, with STYLE! 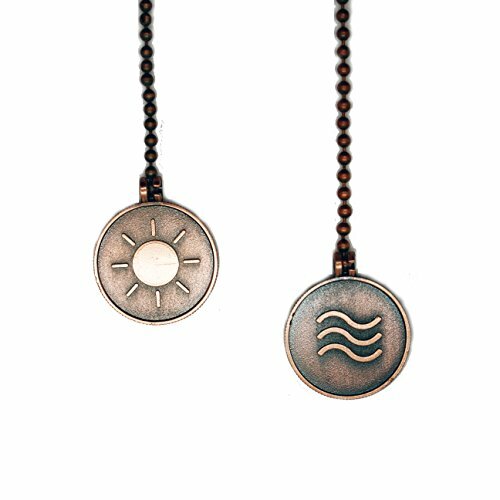 (Package includes 1 SET = 2 - 12 inch chains, 2 - ball chain connectors, 1 wind coin, 1 sun coin). EXTEND your ceiling fan pull chains by 12 INCHES! PERFECT sized, 1.25 inch (3 cm), ridged coin edge, double-sided WIND and SUN pulls! STANDARD #6 ball chain fits ALL ceiling fans! 12 inches of #6 (3 mm) fan ball chain PLUS adaptor/connector! EASILY reach and identify which ceiling fan chain extender is which! BUY this Top Rated ceiling fan pull chain on SALE Now! If you have any questions about this product by 1CAMO, contact us by completing and submitting the form below. If you are looking for a specif part number, please include it with your message.